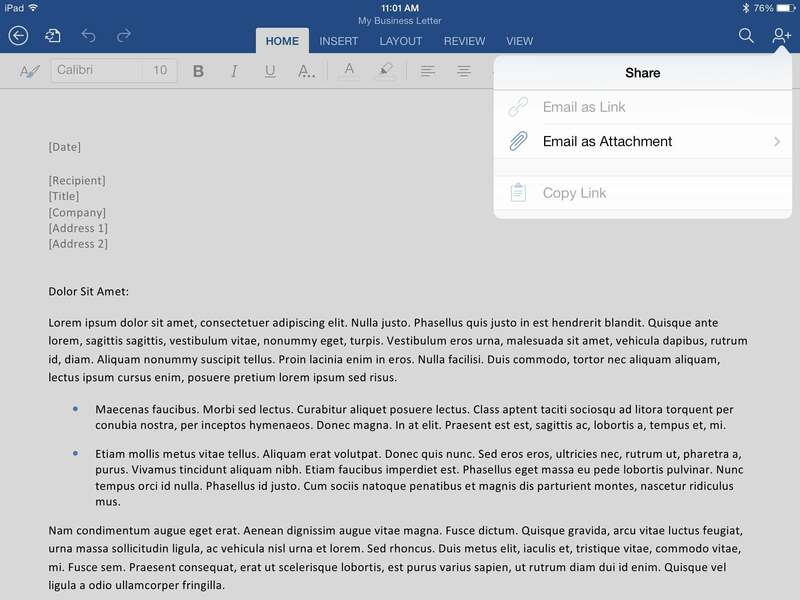 Microsoft’s Office for iPad update added PDF export to Word—barely. After 20-something minutes of infuriated tapping, I found the option hidden in a menu you’d never expect—and it didn't do nearly as much as I expected. Remember how you couldn’t print with the initial release of the app? 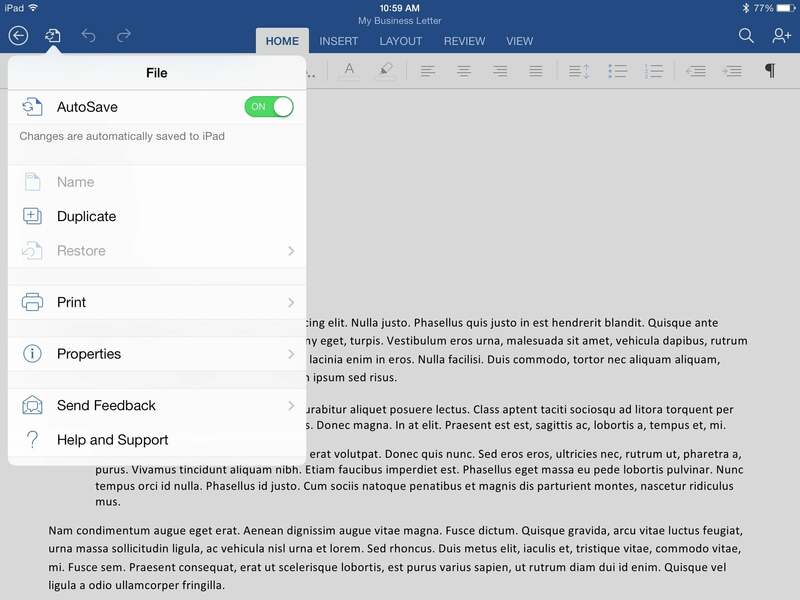 This release allows you to export PDFs only as email attachments. This isn’t enough for iOS users be truly productive. You needn’t be at the mercy of missing or half-baked features, though. Some of the gaps left in Word’s functionality can be filled in with a little help from IFTTT. If you’ve used desktop publishing suites like Office 2013, Google Drive, or LibreOffice, you know the File menu is where exporting normally happens. 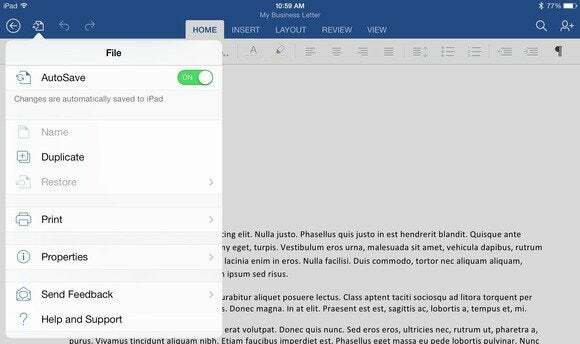 Confusingly, Word for iPad doesn’t do it this way. Word for iPad’s File menu is noticeably lacking export options. Instead, Microsoft opted to place the command in the Share menu and gives you just one option: to email the PDF as an attachment. 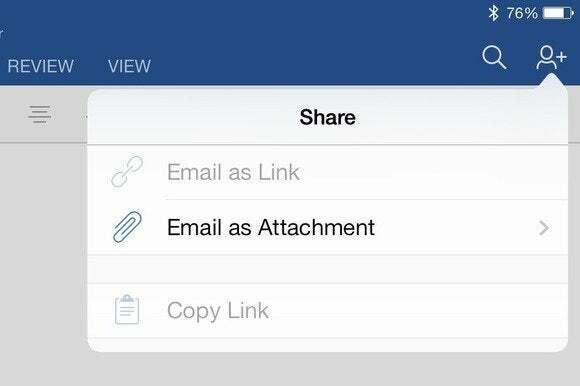 To do this, open the Share menu by tapping the Share icon (it looks like a little human torso with a '+' sign next to it). 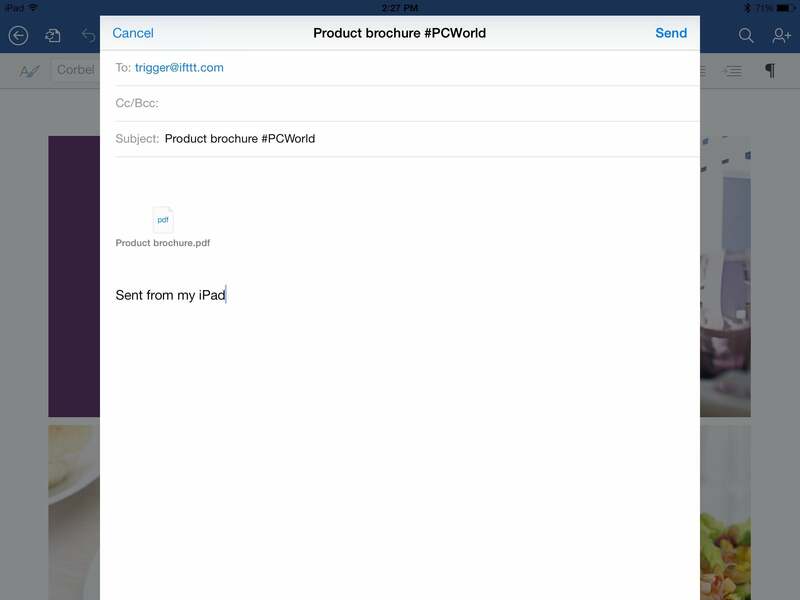 From there, tap Email as Attachment > Send PDF. The ability to export a document as a PDF is hidden behind a vague ‘Email as Attachment’ option, instead of the File menu where users might expect. An email form will appear with the PDF file attached. It’s all pretty easy, but extremely limited. Microsoft didn’t include the ability for you to export a PDF directly to your iPad’s local storage, for instance. Unless you enjoy sending yourself emails, there are no elegant ways to get at that PDF. That’s why we’re going to use the power of the cloud to give Word a little extra muscle. What if you want to share the document to the cloud without uploading the original Word document? Microsoft lets you save a document to OneDrive or SharePoint, of course, but some of us prefer other services. 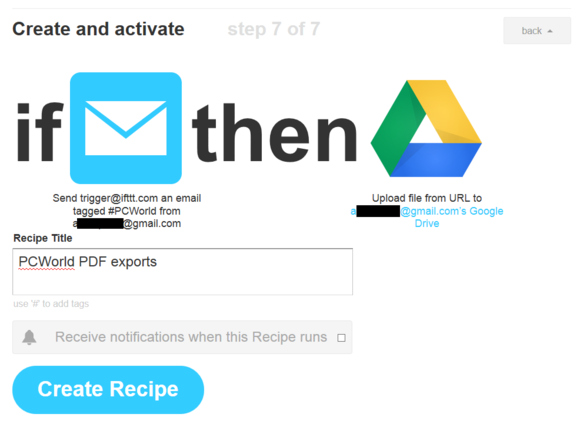 IFTTT allows you to upload files to your cloud storage via email. If you aren’t familiar with IFTTT, I’d recommend learning to use it to automate online tasks. For our IFTTT recipe, you’re going to need two channels: Email and a cloud storage service. In our example, we’ll use Google Drive. It’s just as easy to alter this recipe to work with the Box or Dropbox channels. First, you need to activate the Email channel so IFTTT can tie emails from your email address to your account. Navigate to the email channel by clicking Channels and then clicking on the Email channel icon. Enter your email address, and IFTTT will send a PIN to your email that you’ll have to enter on the following page. Next, you need to set up your cloud storage channel. For Google Drive, navigate to the Google Drive channel in the same way you did with the email channel. To activate Google Drive, you may be asked to log in to your Google account. Once you’re logged in, Google will ask if you want to let IFTTT have access to your account. Click Accept, and the channel will be ready. Now, we have to create our recipe. Click My Recipes, then click Create Recipe on the next page. Click this and select Email as your trigger channel. The Email channel only offers two triggers. Use the ‘Send IFTTT an email tagged’ option to be able to create different recipes using hashtags. 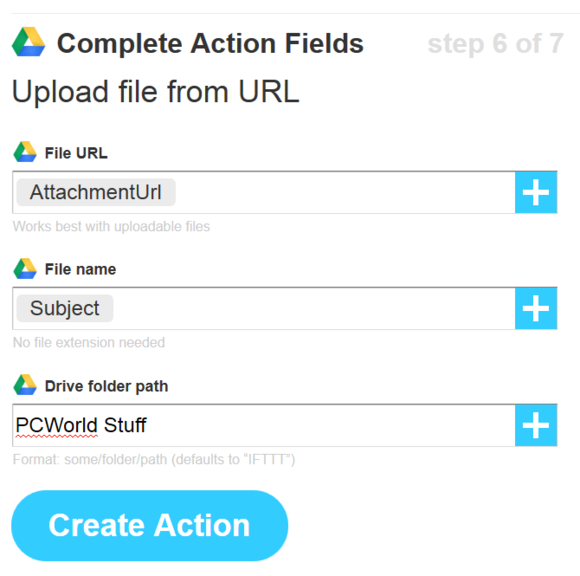 Select Send IFTTT an email tagged and enter a hashtag that you’d like to designate for file uploading. This is really useful because you can control exactly where each file will go by using hashtags in the subject of the email. 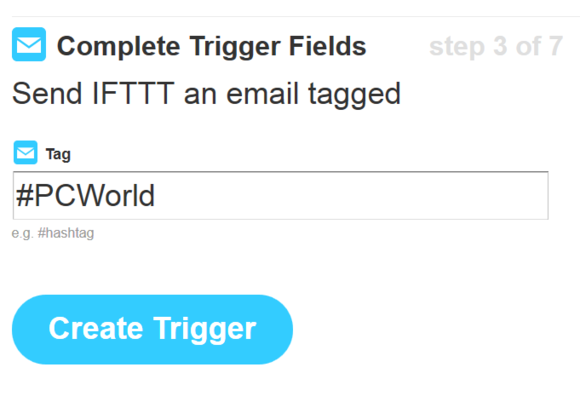 By adding tags to the subject of your email, you can create different IFTTT recipes for each tag. Say you wanted to upload TPS reports to a folder on Google Drive called TPS, you could use the hashtag #TPSReports in the subject line, and IFTTT will process it using the appropriate recipe. For this example, I chose to use the hashtag #PCWorld in my recipe. When you’re done, select Create Trigger. Next, you have to set the action. Select then and Google Drive. Next, select Upload file from URL. Google Drive offers several actions, but in this case, we’re just going to use Upload file from URL. 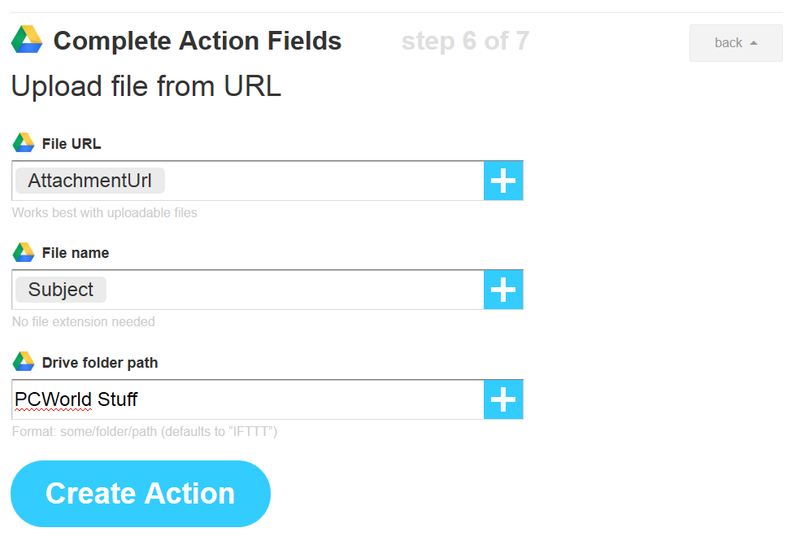 IFTTT will pre-fill the action fields with the most ingredients for that action. Leave the File URL field set as the Attachment URL, as that’s where Drive will get your file. 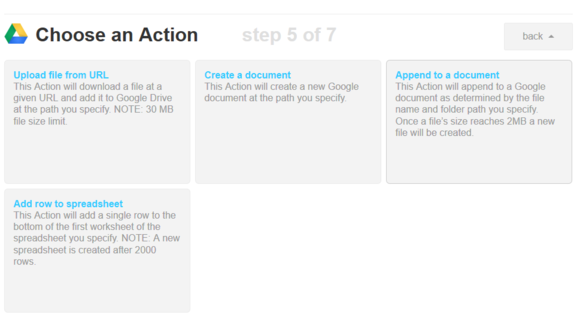 IFTTT will prefill the Action Fields for you. Most of the defaults are OK, but consider changing the folder path. Finally, you have to set the folder you want the file to be added in. This will default to IFTTT/Email, but you can set it to just about anything. You should note that if you leave the field blank, the folder defaults to ‘IFTTT.’ If you want to drop the file in the base Google Drive folder, you can input / as the path. Again, when you’re finished, click Create Action. Now you’ll be able to name the recipe. You’ll also be able to select whether you want IFTTT to alert you via the IFTTT Android or iOS app when the recipe runs. Give your recipe a name that will help you remember what it does. If you like, you can choose to receive alerts from the IFTTT app when the recipe runs. When you’re finished, click Create Recipe. Now you’re all ready to test it. In the iPad Word app, simply email the PDF to trigger@ifttt.com with the appropriate hashtag in the subject line. It may take a minute or two, but the PDF will be automagically added to your Google Drive (or other cloud storage) account. By using IFTTT, you can email your PDFs to trigger@ifttt.com and have them added to your cloud service of choice. This is only a half-solution to the main problem: the lack of local PDF export. Plus, the export option is dependent upon an Internet connection. Luckily, if you send the email without an Internet connection, your email app will deliver the email as soon as you’re back online.